Living in Washington definitely has its perks. For one, I can usually buy a pretty substantial amount of apples for a fraction of the cost that I would find at the grocery store. That means, if I get my act together, I can enjoy some of them fresh out of the box, and put some of them away for winter…like the good little squirrel that I am. Can them. There are about a million ways to can apples, but my favorites are apple butter, applesauce, and apple pie jam. Store them. Some apples can be stored for a pretty darn long time under the right conditions. Dehydrate them. Apple chips make for a fantastic snack. Freeze them. Frozen apples are great for smoothies and mid-winter apple crisps or pies. To freeze them, I like to slice them and sprinkle them with a little fruit fresh. Then, I lay them on a cookie sheet lined with a Silpat to freeze individually. Once they are frozen, I transfer them to freezer safe bags. Toss them into salads. They add a really nice crunch and just the right amount of tart and sweet. Integrate them into breakfast. The HH LOVES when I add some fresh chopped apples to his Sunday morning oatmeal, or when I get really crazy and whip up some Baked French Toast Casserole with Apples or Sausage and Apple Cheddar Biscuit Bake. Slice them and enjoy them dipped in a little homemade peanut butter. Add a little variety to your cookie recipes. Apple Cinnamon Oatmeal cookies are one of my favorite ways to put a delicious spin on oatmeal cookies. EVERY fall, I like to make a batch of caramel apples. They are a super nostalgic thing for me–like school supplies and the smell of the heater the first time it kicks on in late fall. It would be un-American of me not to at least mention using apples for Apple Crisp or Apple Pie. 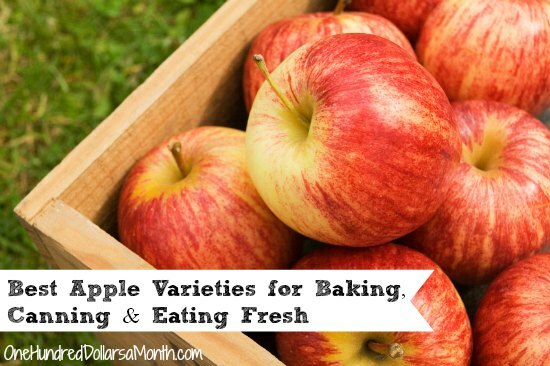 Do you stock up on apples this time of year? How do you use them? Here in western Michigan, apples are a big crop too. I’m looking forward to them! I primarily make applesauce and last year I froze some to use in crisps. Yum. Last season we ate WAY too much Dorset Apple Tray Bake. It was seriously addictive! This time around, I’ll look for longer lasting ways to use my apple harvest, like preserving them. And, that apple pie jam looks like a very good candidate. Peel and slice apples into a bowl of salt water, 1 tsp to a qt of water, and they will not darken in the freezer. I also cut them and do the salt water bath just to have them in the fridge ready to eat. They keep 5-7 days in the fridge. I read that apples can be stored in the crisper drawer for many weeks if they are misted with water every week to keep them from drying out. I did not try it so can not verify that it works. A friend whose family grows apples told us that apples are put in warehouses and the oxygen is pumped out so that they do not dry out, rot, etc and that is how apples are available year round. We are just south of NC apple country and enjoy a drive up to the mountains every fall for our apples. I ALWAYS stock up on apples around harvest time. I grew up in upstate NY and now live in Ohio by lake Erie, and they’re just not the same as home, but we still go through two or three bushels by thanksgiving. I do bake a lot, but honestly my kids just eat most of them in straight!